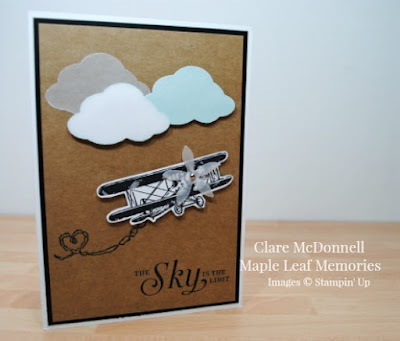 I love the free stamps available in this year's Sale-a-bration brochure for every £45 order and the Sky is the Limit was top of my list, particularly as it is available for a limited time only. I love the samples in the brochure and CASed this card from one of those. I used the Tree Builder Punch to create the clouds, and inked the edges with Soft Sky ink. I stamped the plane image onto Whisper White card before cutting it out and raising it with some Stampin' Dimensionals. An extra little detail on this card that you might miss is the propeller cut from vellum using the Flower Fair Framelits and attached with a small silver brad. Here is a list of the products used to create this project which are all available to purchase in my online shop. Don't forget to use the Hostess Code for January when ordering which is FUDQ7AEQ and receive free product from me. Only use this code for orders between £25 and £150, orders over £150 will qualify for their own Stampin' Rewards. See the sidebar for more details on using the code.